A vegetable stir fry is a very simple and quick meal that tastes great. Feel free to substitute the vegetables you like best. Heat the oil in a frying pan over low heat. Add the garlic and onion to the pan, quick sauté for a few minutes. Add the zucchini, carrot, and ginger, sauté a few minutes more, or until the carrot brightens in color. Add the broccoli and continue to sauté for 5 minutes, or until the broccoli begins to turn a bright green color. Add the Braggs, pea pods and spinach and stir in. Turn off the heat and let the pan stand for a few minutes till the spinach is wilted. Serve the veggies over brown rice, quinoa or millet. Note: This is just one of the recipes specific for the Weight Loss BootCamp. Check it out! 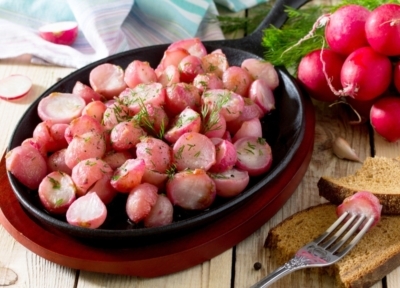 Braised Radishes with Dill – These braised radishes are tasty with the peppery taste of the radishes balanced by tangy cider vinegar, coconut oil, and dill weed making a delicious addition to any meal. Leeks with Carrots and Ginger – Leeks and carrots are for sure favourite vegetables in my kitchen. Pairing them with yummy ginger and garlic makes a very refreshing delicious addition to a meal. Also, all these ingredients are very nutritious for you too. Carrots with Arame – This is a great addition to any meal especially if you like ginger and carrots.